Do business-run public services save taxpayers money? President Trump has said he wants to turn over certain public functions, including air traffic control, to profit-making private contractors. While his specific intentions remain unclear, supporters of privatization contend it would save money and inject competition into what they claim is a bureaucratic system that lacks efficiency and innovation, discourages cost cutting and falls prey to political whim. 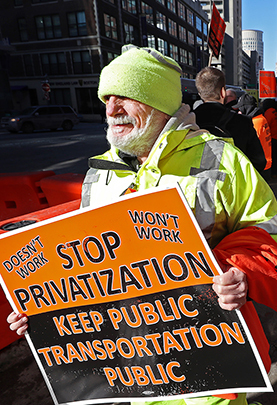 Opponents argue, however, that privatization often fails to reduce costs and undermines democracy by putting private business in charge of vital public services. Republican President Ronald Reagan advocated privatization in the 1980s, and it has grown under both Republican and Democratic administrations to include charter schools, municipal water systems and military operations. Still, some of the fervor for privatization has cooled in recent years, especially after studies found higher rates of civil rights abuses, medical neglect and assaults on guards in privately run prisons than in government facilities.